The moment I opened Sanctuary I am instantly transported back to primary school. witch, by way of a few logic puzzles. Granny’s Garden created my love for this simple yet Incredibly captivating concept for games and in Sanctuary I find the child in me bouncing around with excitement. The music is glorious and a pleasure to listen to, even much so that I am currently writing this at precisely the moment after opening the game, It captures the feeling of fantasy and adventure so brilliantly that it draws you in to a world that is there for you to create. The game is presented through text in story, instruction and presentation. A younger generation could easily criticise it’s look for how primitive it may come across but there is art in what graces your screen, expressing and encouraging your Imagination to take control. It is a breath of fresh air to see something so nostalgic in the age of where pixel gaming seems to be making a U turn in popularity; Sanctuary goes that one step further. You enter the campaign mode with a choice of a hero, a Barbarian, Paladin, Assassin, Wizard, Druid and a Ranger. Choosing an Assassin I am then brought to a Castle with a small paragraph explaining the way of the Assassin “Trust in the power of your sharpened potato, and you will go far.” Instantly I feel like I have been transported to the world of the very first Monty Python, which of course, Is absolutely fantastic and Incredibly unexpected. Being given the option for a detailed run down of the Assassin’s abilities brings, once again, a hilarious snort toward titles like “It’s time to run around and start stabbing things with knives!” Boasting a selection of 1400 weapons and armors to choose from and discover on your travels, to experimenting with a combination 160 class and race combinations. All of THAT contained in this little pleasantly packaged fantasy world is just too exciting to imagine. Character customisation leads to the selection of class, gender, and place of origin after which leads you to selecting a race! After making my place of origin the, Southern parts of Sirea, I’m asked to select a race from Goern, Sonite and a Huskian. Each race has 3 different sets of abilities and perks that range from “Iron Scales” granting you 50% resistance against bleeding to “Guard Crush” that has a 33% chance to break an enemy’s guard per turn. The opening trailer is brilliantly impressive and the quick story telling of the potato I just apparently murdered was almost unexpected but still rather hilarious. Even more customisation is introduced as you start the game by bumping into a mysterious female strange granting me a weapon and a bag of gold as ‘well as a health perk which leads to more stat selections as well as having to customize a robotic battle pet. It’s almost becoming a little too overwhelming with so many perk stats, HP, MP and various other short term text to fit on the screen that I find myself randomly selecting whatever looks beneficial to my untrained eye. I’m met straight away by an Arena Brawler that looked to me like a huge, box like, mechanoid and according to his stats is a big of a bruiser! The battle screen is a simple display of you and your enemy’s health points, attack dps and my various abilities available to me to, hopefully, take down my foe. I start the game again using a Barbarian and am brought to a screen a little more pleasant. A landscape resembling 3 hills and a tree, beneath me is a quest panel, games options as’well as my health points, attack stats, mana points and gold coins. The game works in the simple format of selecting a number for a desired action and also spotting a green coloured letter on screen can lead you to special items of secret areas. Winning battles levels up your character and in turn lets you upgrade your hero’s stats and attributes for a better chance against the enemies you will encounter on your adventure. SanctuaryRPG Is everything I remember and fell in love with on that BBC Micro Computer back in school in 1990, it’s exactly what brought me to love computer games and lead me to the wide imagination that I have today. 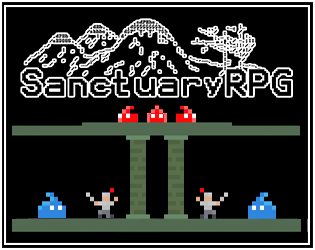 If you’re looking for a game to sit on your desktop, on a rainy day with an endless supply of cups of tea to then be transported to a nostalgic fantasy world, then I couldn’t recommend anything more than SanctuaryRPG.